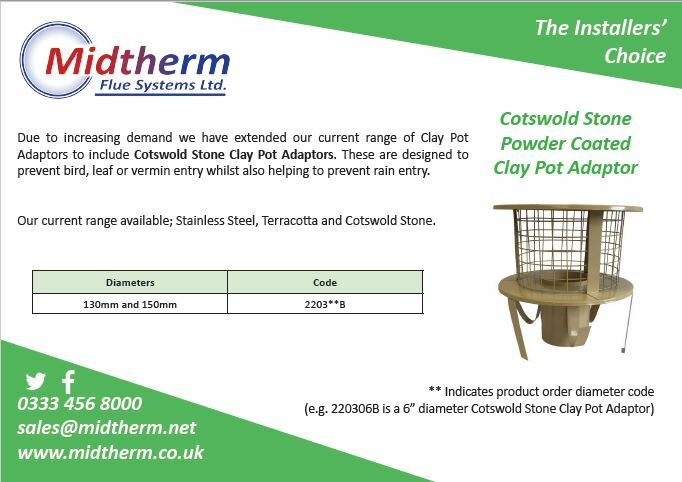 Due to increasing demand we have extended our current range of Clay Pot Adaptors to include Cotswold Stone Clay Pot Adaptors. These are designed to prevent bird, leaf or vermin entry whilst also helping to prevent rain entry. Our current range available; Stainless Steel, Terracotta and Cotswold Stone. Order code is 2303XXB (enter 05 for 125mm diameter and 06 for 150mm diameter). Call the sales office today for a price.